Mi has redefined the mobile phone market by providing affordable smartphones and mobile accessories with the latest technology. 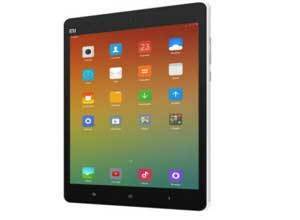 The Mi Pad is their entry into the Tablet market. With a powerful NVIDIA Tegra K1 CPU and 192 supercomputer-class GPU cores, the Mi Pad is the perfect blend of performance and elegance. Read your favorite e-books, browse the web and watch your videos on this tablet’s 20 cm (7.9) high resolution IPS display. It produces a pixel resolution of 2048 x 1536 at 326 pixel per inch and has an aspect ratio of 4:3 which ensures that your text and images are rendered beautifully, in both portrait and landscape modes. Equipped with NVIDIA’s 2.2 GHz Tegra K1 quad-core ARM Cortex-A15 processor, the Mi Pad is not only battery efficient, but it also intelligently determines when to use more power for intensive tasks and less power for low performance tasks to extend battery life. The Mi Pad uses a Kepler GPU architecture found in next-gen PC gaming and utilizes 192 CUDA cores to give you incredible visual capabilities. It also has a 2GB LPDDR3 RAM and 16 GB of flash storage for your games and HD videos. You can even expand the memory up to 128 GB with the tablet’s microSD slot. Fitted with a 6700 mAh lithium-ion polymer battery, the Mi Pad lets you enjoy your media content for hours on end. It also charges quickly on both 9V 1.2A and 5V 2A inputs (Full charge in 3.5 hours and 4.5 hours respectively). Capture every moment in rich details on the Mi Pad as it comes with an 8MP primary camera and 5MP secondary camera. You can record 1080p full HD videos even in low-light as the tablet features a BSI sensor which ensures clear, crisp photos on either camera. Its f/2.0 aperture lets you take great photos with every click.